At the centre of Hans Place, London, is an oval communal garden of mature trees. Built into its railings, almost opposite the front door of No. 22, is a monument in polished pink granite, surmounted by a broken column. Such a column indicates a life cut short—but anciently, too, it was a Renaissance signifier of fortitude, one of the four cardinal virtues. Above: A broken column is the most striking feature of the memorial above Arthur Griffith’s modest grave in Glasnevin Cemetery. A broken column is also the most striking feature of the memorial above Arthur Griffith’s modest grave in Glasnevin Cemetery. Did Maud Griffith get the idea for this when she later recalled a tense visit to Griffith at 22 Hans Place during the Treaty negotiations in 1921? A photograph in the Illustrated London News on 19 August 1922 shows them both standing in the doorway there (see HI 24.3, May/June 2016, p. 41). The monument in Hans Place was erected in 1886 in honour of a fallen Englishman who lived nearby—Herbert Stewart (1843–85), a hero of Britain’s war in the Sudan. Winston Churchill, secretary of state and one of the men with whom Griffith was then negotiating, had himself briefly served in the Sudan while simultaneously working as a war correspondent. 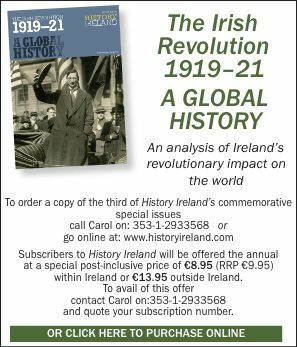 Griffith was in Africa at the same time as Churchill, but in his case working as a journalist in the far south and helping to celebrate there the centenary of the Irish rebellion of 1798. Churchill wrote a book on the reconquest of the Sudan, The River War, in the first edition of which he criticised that campaign. Subsequently, after being elected to parliament and ostensibly for self-serving purposes, he moderated his account in a later edition. For his part, Griffith composed a scathing ballad about that war—‘A Song of the Khalifa’—which he published in the United Irishman on 11 March 1899. Did they discuss the Sudan during a tea break in Downing Street? A broken column has been used for other memorials. Floral arrangements in that shape, for example, adorned the funeral cortège of Michael Collins. A broken column erected in County Wexford when the Fenian Charlie Farrell of Enniscorthy died in 1913 was taken to mean that ‘when Ireland was free, his monument would be finished’ (Bureau of Military History, WS 1041, Thomas Doyle). In any event, Maud decided on a broken column for her late husband, although she had to pay for it herself. 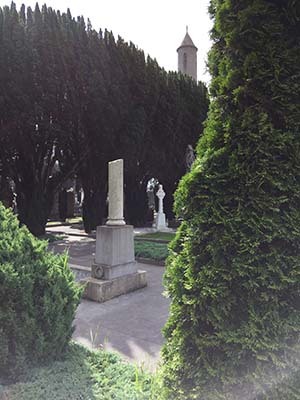 In her Commemorating the Irish Civil War, Anne Dolan has described the pathetic circumstances of Griffith’s interment and commemoration by the state at Glasnevin Cemetery, Dublin. Griffith was by no means the only Irish leader whose life was cut short before he could give his all. 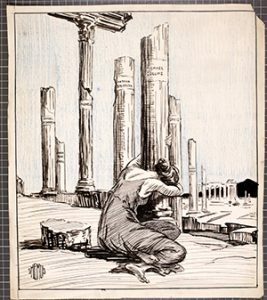 This fact was marked by the Irish newspaper illustrator ‘Shemus’ in a striking illustration published after the death of Collins in the Freeman’s Journal on 24 August 1922. It shows Ireland weeping at the foot of a broken column marked ‘Michael Collins’. In the background, other columns of a ruined temple bear the names of Arthur Griffith, Charles Stewart Parnell, Daniel O’Connell, Thomas Davis, Robert Emmett, Wolfe Tone and Owen Roe O’Neill. Colum Kenny recently retired as Professor of Communications at Dublin City University.